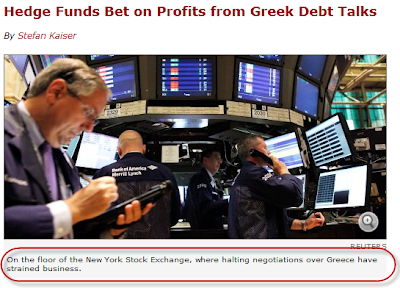 Mainstream media has been hyping up the hedge funds' role in the Greek restructuring process. The evil speculators are at it again, "holding out" on the voluntary exchange for new bonds. The argument goes that hedge funds bought bonds at a deep discounts and also bought the CDS protection. If there is a disorderly default or an involuntary restructuring, these funds would lose money on their bonds but more than make up for it on the CDS. Der Spiegel argues that these speculators are getting "free money" in this transaction. Der Spiegel (Stefan Kaiser): Things look different for the hedge funds if an agreement breaks down. In this case, the threat of insolvency exists. The chance that the bondholders would get their money back would dramatically decrease. The bonds would have less value than before, and would no longer be worth €30 million, but say just €10 million. And the CDS guarantees would be due. The hedge funds would, depending on the arrangement of the CDS, receive up to 100 percent of the bonds' nominal value, or €100 million. Under this scenario, the hedge fund that invested €60 million would get €110 in return - a profit of almost 100 percent. But let's check Der Spiegel's math. Evil Capital Hedge Fund buys a Greek bond at €30 (per Der Spiegel's comment) and a CDS protection that would cost them say €70. According to Der Spiegel the bond ends up worth €10 after the Greek default. The CDS will pay out par less the recovery amount or €100 - €10 = €90. So the trade makes them €20 on the CDS (from €70 to €90) and the bond loses them €20. Evil Capital is net flat on the trade, not up " almost 100 percent". Some may argue that the shorter maturity CDS is cheaper than €70, closer to €60. But shorter term bonds are actually more expensive, closer to €40 (the 3/12 maturity bond is around €38). So the same math applies and Evil Capital still barely breaks even on the trade. Amazing. No free lunch here - the market is a bit more efficient than Der Spiegel gives it credit for. And Evil Capital may not be that smart after all. Nevertheless hedge funds are still derailing the negotiations according Der Spiegel and the Greek Government won't stand for it. Der Spiegel (Stefan Kaiser): The Greek government, though, has threatened not to tolerate such freeloaders. If an agreement is reached with 80 percent of the bond holders, they want to force the remaining 20 percent to take part in the haircut. In that case, the existing bonds would later be so-called "Collective Action Clauses." The hedge funds could still cash in because in this case the debt repayment would not be voluntary, and it would be considered a payment default, making the CDS also come due, and the gamblers would profit. But wait a minute here. What other bond holders may be holding out? The answer is that the other big holdout may in fact turn out be the ECB. With the support of the German government, the ECB does not want to participate in the voluntary exchange. Bloomberg: While the ECB faces pressure to join private-sector investors in accepting losses on Greek debt, the central bank sees any participation as risking damaging confidence in the institution, two people familiar with the Governing Council’s stance said. The debt was acquired for monetary policy purposes and the ECB is firmly opposed to any restructuring, they said on condition of anonymity because the matter is confidential. Therefore not only there is no free lunch in the Greek CDS-bond trade, but the holdouts may actually be dominated by the ECB, not hedge funds. For their focus on sensationalism rather than unbiased journalism, Der Spiegel and Stefan Kaiser get the Sober Look Hype Award. Congratulations. And by the way, this Der Spiegel story opens with the following photo. Read the caption. NYSE business "strained" by the Greece negotiations? And we wonder why the public is confused about financial markets.